My story is a little different from some you’ve read because I race a Honda, for Honda. I work for Honda R&D Americas in Raymond, Ohio, working on interior packaging and testing. 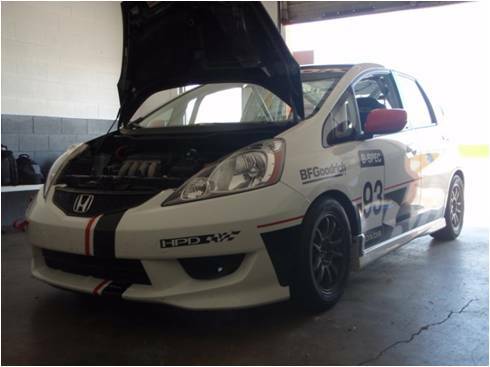 I race with a team of guys who are all engineers, and we race with limited financial and logistical support from Honda. I started the road-racing part of the racing club 13 years ago and have been road racing ever since. 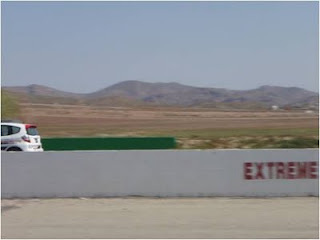 I also did a little performance rally racing for about a year prior to that. Primarily, I race in the National Auto Sport Association (NASA). 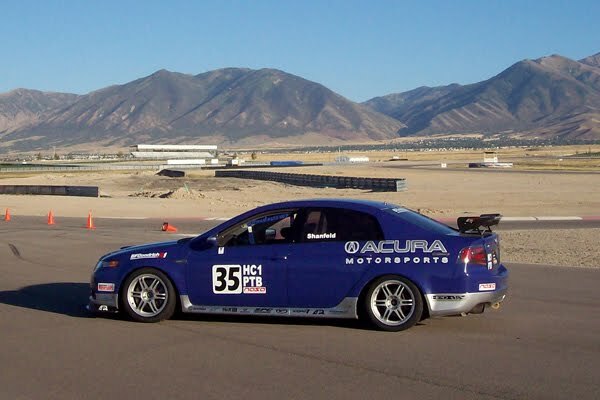 Last year, I finished first in Performance Touring B and third in the Honda Challenge at the NASA National Championships at Miller Motorsports Park in Uta h, both in an Acura TL Type S. I also raced for the Honda team at the 25 Hours of Thunderhill in a Fit prepared to prototype B-Spec rules, a racing class for sub-compacts that looks set to be adopted by both NASA and the Sports Car Club of America. Given the nature of my job, it might be hard to figure out the connection between interior packaging and racing. Racing, however, has given me a greater understanding of cars. The things I’ve learned working on race cars helped me have a greater knowledge of parts I wouldn’t get to know in so much detail during my day-to-day job. I now know what the chassis durability guys are talking about, or what the engine component crew needs. It gives me a good perspective of the entire car when we invariably end up negotiating for some piece of real estate that I want for something and they want for something else. The TL was one of the performance models that was developed by the R&D Center here in Ohio, as opposed to being developed in Japan. 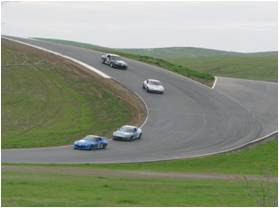 The Type S that I raced at the National Championship was one we constructed for the 25 Hours of Thunderhill in 2004. We were inspired to build it because after it was launched, the model received some criticism for being front-wheel drive, whereas most cars in this luxury segment are rear-wheel drive. What better way to prove its prowess than race it? We won our class by about 50 laps that year and ended up third overall. The car is a lot faster than you would think, and it surprises a lot of people. Since then, the car has been kicking around, seeing constant action. It’s run the 25 Hours twice, a couple of 13-hour races and a few four-hour events, in addition to countless sprint ra ces. It’s fast, it’s tough and it never breaks, so we just keep racing it. It has been driven by 13 different drivers in its seven-year life and accumulated over 10,000 racing miles. At the National Championships, I chose to run Performance Touring B in addition to Honda Challenge. The car was essentially the same for both races, the only difference being tires. Performance Touring is a points-based category where any car can run. You start with a base classification that comes from the car’s factory configuration – driven wheels, horsepower, etc. Anything you modify on the car is assessed a certain number of points, and for every 20 points you bump up a class. Most of the modifications include suspension upgrades and reduced weight; the engine is an unopened crate motor with a different intake and exhaust. In PTB I qualified on the outside front row and led from the first corner. Winning races in cars which we developed is a big source of pride for all of us at Honda R&D. That includes not only the members of the racing team, but, when we bring back the results to show everybody that had a hand in development of the car, it’s a great feeling. We had that same feeling with the Fit at last year’s 25 Hours. Running alongside the crew with our new CR-Z hybrids, we were testing the B-Spec rules. Mazda also had a Mazda2 B–Spec car in the race. The Fit was built mostly by our Torrance-based teammates; I just showed up to help them button it up and get it to the track. I was one of seven drivers – including Simon Pagenaud, the accomplished racer who won the LMP2 class for HPD in the American Le Mans Series last year. The race was pretty uneventful for the Fit. We kept the car on the track, didn’t break anything and avoided any penalties. Our biggest challenge was dealing with the very wet weather and the faster cars around us. The car was actually fantastic to drive, especially in the wet. It was probably the best car I’ve ever driven in the wet in terms of natural balance and confidence in the tricky conditions. Even in the dry, it was a lot better than I expected. We ended up fourth in our class, having covered 1,710 miles at an average speed over 60 mph. And we turned our fastest lap just minutes from the end. For 2011 I’ll primarily race an S2000 CR, to get some more rear-wheel drive experience. Our plans are still up in the air, but we know we’ll be at the NASA National Championships. This year, they move back to Mid-Ohio Sports Car course, just short distance away from Honda R&D and one of our favorite stomping grounds. 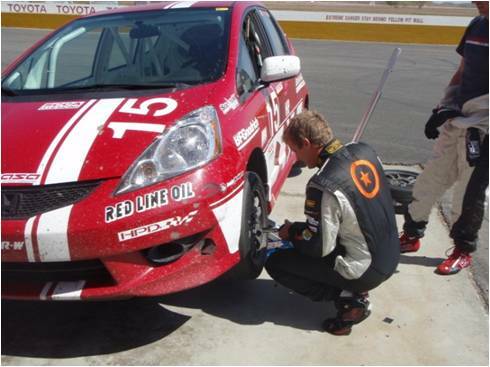 Look for Brian Shanfeld and other members of Team Honda Research on track in NASA competition in 2011, including the NASA National Championships at Mid-Ohio Sports Car Course on Sept. 8-11. In less than ideal weather conditions, THR-W drivers Lee Niffenegger, Sage Marie and Matthew Staal completed the second round of the SCCA National championship series with two race wins, three second and one third place finish. Lee Niffenegger, running his always consistent Honda Racing/HPD Honda Civic Si, shod with BFGoodrich R1 tires, drove to two uncontested race wins in Showroom Stock B class. Sage Marie had a competitive battle with the Honda S2000 CR Tom Wickersham throughout the first race settling for second place in the T3 class, driving his Honda Racing/HPD Honda S20 00 CR. Starting the second race of the weekend in 3rd place, Sage capitalized on a strong start to move quickly to 1st in class ahead of Tom Wickersham, and the Mazda of Dan Cooper. The battle remained strong until a missed shift by Sage cost him the lead and resulted in a 2nd place finish. The competitive and popular STU class featured eight entries for the weekend. 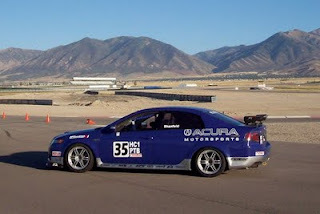 For Saturday’s race Matt was able to qualify his HPD Acura RSX Type-S a solid 3rd position behind Wilkersham’s Honda S2000 and the Mazda of Marc Hoover. Upon the green flag, Staal was able to stay in the hunt by moving up to 2nd place in front of Wilkersham. 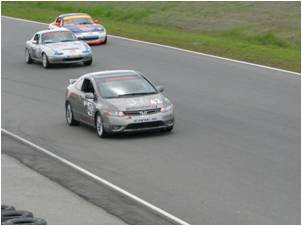 However, on the 3rd lap, Staal experienced a 4th gear failure causing him to drop back to 3rd in class. While traveling at a slow pace to assess the condition of the transmission, Staal realized he could still continue in the race by using only 3rd and 5th gears. Despite this substantial disadvantage, he was able to pick up the pace and slowly reel in Wickersham’s S2000 and succeed in passing him on the last lap to regain 2nd place. For Sunday’s STU race, Staal opted out of qualifying to preserve the transmission. Starting at the back of the field, Staal was able to pick off STU competitors one by one to settling into 2nd place despite being hamstrung by the lack of a 4th gear. 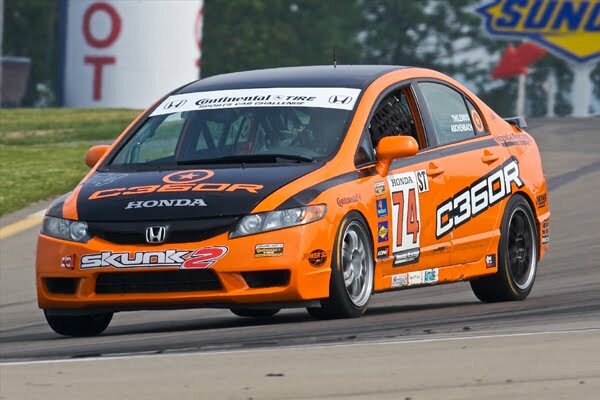 Team Honda Research West would like to thank their sponsors (Honda Racing/HPD, BF Goodrich tire) for supporting our team in its quest for the championship title at the SCCA National Championship Runoffs this September at Road America. 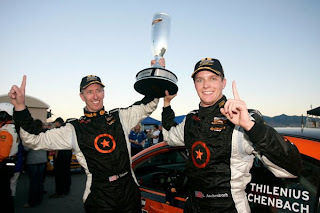 I’ve been racing for more than 25 years, and about 20 of those professionally, mostly in the series now known as the Grand-Am Continental Tire Sports Car Challenge. But last year was the highlight. Together with Lawson Aschenbach and the stellar crew at Compass360 Racing, we won the team, manufacturers’ and drivers’ championships in the Street Tuner class. 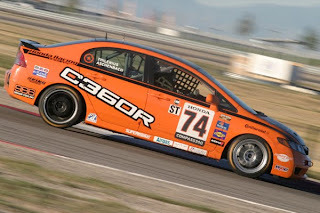 Compass360 Racing is a four-car Honda Civic Si team from Toronto. Before joining the team at the beginning of last season, I had driven for Bill Fenton Motorsports, another Honda team in the series. When Bill decided to move on to other things, I contacted Karl Thompson at Compass360 about doing something together. He teamed me with Lawson, and it was the beginning of a great year. I didn’t know Lawson before that season, but we just really clicked right off the bat. I’m a bit of a smartass and he put up with that. He takes my ribbing pretty well and I take his. But it was really a lot of things that made it work. We found out that we both liked to sit in exactly the same position, so on the driver change, we didn’t have to adjust the belts … we didn’t have to adjust the seat … little things like that. Our backgrounds are similar; Lawson started out in open-wheel formula cars like I did, so we like the car the same way, with the same setup. 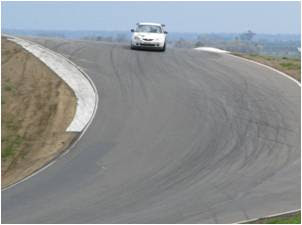 We don’t like a super-loose car; we both like a car w ith a bit of understeer on corner entry and in mid-corner. If he got in the car and liked it, I knew that I was going to like it, and vice-versa. The 2010 season couldn’t have started off any better; we qualified on the front row at Daytona and won the race. We later won at Watkins Glen, where I both started my professional racing career and had a big crash in 1992. But one race that stands out in my mind was Mid-Ohio. We were running pretty well, in the hunt for at least a top five and maybe a podium finish, when Lawson got hit by another car and broke a wheel and had to come in for a stop. It would have been so easy for him at that point to quit and accept a bad finish; but he just kept plugging and plugging and got us back to 10th. For me, that was a great thing, because I’m thinking, “Here’s a guy that’s never going to give up.” It was one of those weekends where nothing really went right, but everybody pushed so hard and tried so hard, that I’m really proud of that weekend even though the results weren’t that great. For 2011 I’m teamed with Zach Lutz in the No. 74 car. Zach finished third in the drivers’ points last year in the No. 75 car. We both handled qualifying and starting duties for our cars last season, and we were very competitive with one another. It was always positive, but clearly you want to beat your teammate! That was one of the things that made the season so much fun. Through the first two races at Daytona and Homestead, Zach and I have been working together really well. It’s been great. We seem to like the car the same way, just as with Lawson. We’ve struggled a bit so far this year with some mechanical problems; but there is no way this car isn’t going to be good for the rest of the season. It’s the nature of the beast that if you keep pushing and pushing, you always find the weak link. Last year we got lucky and didn’t have things break. I’m confident that we’re going to be there the rest of the season challenging for podiums. I don’t think there’s a better team out there than Compass360. We’ve got a good shot not just based on speed, but on strategy as well. Our four-door Civic Si is a fantastic racecar. We’ve got a restrictor becaus e of the rules this year, so we’re struggling a bit with power. But the handling of the car is fantastic. It really, really works. With that and the support we get from Honda, such as having a Honda engineer like Lee Niffenegger at the races with us, I’m expecting good things. Lee is a racer himself and understands the importance of the little things. He knows that being half a second off is a big deal, unlike some that aren’t intimately involved with the sport. It’s like we speak the same language. Put all that together with some performance enhancements, and I see us up front for the rest of this season. February 26-27, 2011 THR-W drivers Sage Marie, Matthew Staal and Lee Niffenegger kicked off their 2011 SCCA National season in their Honda Racing/HPD BFGoodrich machines with a combined five race wins and three track records and the San Diego/Cal Club Double National event held the last weekend of February. Lee Niffenegger ran uncontested in SSB to claim first place points on both days, but pushed hard never-the-less, breaking a five year old track record on Sunday.